Birthplace : Bronx, New York City,U.S. Jerry Vale (born Gennaro Luigi Vitaliano) is an American singer. 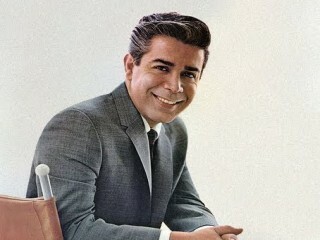 Jerry was one of the most successful popular music singers of the 1950s and 1960s. His popularity came at a time when rock and roll had severely dampened the success of other singers of that era. After 50 years as an entertainer and more than 50 albums, Vale continues to share his romantic pop favorites with audiences at clubs throughout the United States. Vale was born Genaro Louis Vitaliano on July 8, 1932, in the upper Bronx, New York City, New York, to Louis Vitaliano, an engineer, and Philamina "Fanny" Covino Vitaliano, both first generation Italians. Every Sunday the Vitaliano family would have a party at Vale's grandmother's house and she would lay out a spread from "soup to nuts." At least 14 family members and a mandolin and guitar player named Tom Tumas would attend. Vale's parents, uncle, and even other families would join in and sing when Tumas played. This regularly scheduled family fellowship inspired Vale to take up singing as a natural part of this family gathering, and in doing so, learned many Italian-American songs by hearing them sung. Vale recounted to Contemporary Musicians, "It was something that I always looked forward to." At 11 years old, Vale got his first job shining shoes in a barber shop in Mount Vernon, New York. He also cleaned the floors of the shop and customers would ask him to sing because they knew he loved to. He would sing popular songs of the day and instead of getting only a 25 cent tip, he often received twice that amount. The barber at the store steered him to a pianist who taught children songs and who had a show at the Bronx Wintergarden every June. When Vale went to the pianist and she heard his voice and expressed her delight with what she had heard, she invited him to participate in the Wintergarden show. He made his debut there singing a song entitled "Shoe Shine Boy," dressed in torn clothes, a hat sitting sideways on his head, and a shoe shine box in his hand. He was about 12 years old. Vale remembered: "I got a good round of applause and I knew then that this is what I wanted to do." Vale began singing in supper clubs in and around New York at only 15, but claimed to be much older when singing with the Jen Ray Trio and the Matty Marin Quintet. At 16 he had already left school and was working in a factory in Mount Vernon called Todd Products, a company that manufactured transformers for flourescent lights. At 17, Vale left his job at Todd and joined his father who was an engineer who dug excavations for sewage plants on Oyster Bay, Long Island, New York. Vale had already begun to establish a local reputation, and after a year, began making recordings and singing songs of the day with a trio at the Club Del Rio in Yonkers, New York, changing his name to Vale. It was there he met Nick Kenny who was a columnist for the New York Mirror. They became friends and Kenny asked Vale to help him by singing at servicemen's clubs around New York state. He moved on to the Enchanted Room, which was also in Yonkers, with the Marty Marin Quintet where he met singer Guy Mitchell, who was already regarded as a top flight singer on Columbia Records. Mitchell was so impressed with Vale's performance, he arranged an audition with Columbia Records A & R chief Mitch Miller. This was particularly noteworthy since Mitchell himself was also a recording star at Columbia and was essentially helping invite competition. This led Vale to a contract with Columbia Records in 1951, and a year later Vale made his first record on the Columbia label on December 23, 1952. It was called "You Can Never Give Me Back My Heart," backed by Percy Faith and his orchestra. It was reissued in 2000. Nearly two years went by before Vale had his first hit, "Two Purple Shadows on the Snow," which held the number one spot for ten weeks in Pittsburgh, Pennsylvania. There was a dry period without any additional hits. One night, Vale was retiring in a Boston hotel room when he heard a country song written by Eddy Arnold entitled "You Don't Know Me." He returned to New York and convinced Miller to let him record the song. They obtained a copy from Southern Publishing, and Vale was scheduled to record the song with Faith arranging. But Vale became ill with laryngitis on the day of the recording and Faith went ahead and recorded the orchestration without him. Two weeks later, with only an engineer and Vale in the studio, his voice was added to the already recorded instrumental. It became an instant hit and sold more than a million copies. This was followed by "Innamorata," which was on the soundtrack to the 1955 film Artists and Models starring Dean Martin, Jerry Lewis, and Shirley MacLaine. Vale heard another song, "All Dressed Up With a Broken Heart," and again approached Miller about recording it. The song received a large amount of air play but did not achieve hit status. Vale then suggested to Miller that they make albums with tributes to other singers. Three albums were cut: I Remember Buddy, a tribute to Buddy Clark, I Remember Russ, a tribute to Russ Columbo, and Jerry Vale Sings the Hits of Nat King Cole, a tribute to the legendary Nat King Cole. I Remember Buddy was the very first time a recording artist had made such a compilation. Glenn Osser and his orchestra provided the music, and the album became an immediate hit, quickly reaching the top 20. These Vale recordings were the start of 22 best-selling albums that reached the Billboard charts. Vale sang duets early in his career with Peggy King and Felicia Sanders. Later he was scheduled to record "The Song from Moulin Rouge" with Faith, but was stricken with appendicitis; it required an emergency appendectomy and Miller chose to use Felicia Sanders to record it instead. It sold millions of copies and became an all-time hit. In the 1960s, Vale recorded a song called "Have You Looked into Your Heart?" but the song was placed into the Columbia Record vault because of a management change. A year went by and Vale approached new A & R executive Ernie Altschuler about his recording of the song and that he was convinced it was a hit. Altschuler auditioned the song and agreed it was a hit. Vale performed the song on the Ed Sullivan Show, and the next day Columbia Records had orders for more than 40,000 copies. The song made the top ten and became another instant hit for Vale. His television credits include more than 20 guest appearances on the Ed Sullivan Show, 12 appearances on the Tonight Show with Johnny Carson, and 15 appearances on the Mike Douglas Show. Vale has also appeared with Tony Danza and Allen Thicke. On another occasion, Vale was listening to a Steve Allen album of Italian songs and heard an instrumental that sounded very pleasant. He wondered if there were lyrics and telephoned Allen to inquire. Allen told him that he hadn't written lyrics, but called Vale back ten minutes later with lyrics for "Pretend You Don't See Her." The song became a big hit for Vale. In 1990, Vale sang this selection on the soundtrack to the Martin Scorsese film Good Fellas starring Robert De Niro. He also sang on the soundtracks for the 1983 motion picture Easy Money starring Rodney Dangerfield, as well as Donnie Brasco, True Friends, and Casino in 1995. Vale performed two songs in a comedy film to be released in 2000 entitled A Wake in Providence and has an acting part as well. In 1999, he appeared with Gary Busey in the film No Tomorrow. These appearances were followed by an Italian album on Columbia because when Vale played nightclubs, the audiences always made requests for his Italian songs. That started Vale's release of a series of Italian-American albums on the Columbia label. Vale has sung in seven different languages and speaks Italian fluently. He has performed in Australia, the Philippines, Canada, and South America. Although his recordings are very popular in Europe and especially Great Britain, he has never performed there. In 1999, Vale joined singer Tony Martin in honoring Shecky Green with a concert on Long Island at the Friar's Club. Over the years, Vale has performed on the club circuit and been a regular entertainer in Las Vegas. Vale has worked with Glen Osser, Harry James, the Glenn Miller Orchestra, Woody Herman, Wally Gold, Stan Tonkel, Robert Morgan, Ernie Altschuler, Frank Laico, Marty Manning, Mike Berniker, Stan Weiss, and Mitch Miller. Vale's autobiography, entitled A Singer's Life, published by Celebrity Profiles of Long Island, New York, was released in May of 2000.He made cameo appearances as himself in the 1990 film Goodfellas and the 1995 film Casino, both directed by Martin Scorsese. View the full website biography of Jerry Vale.